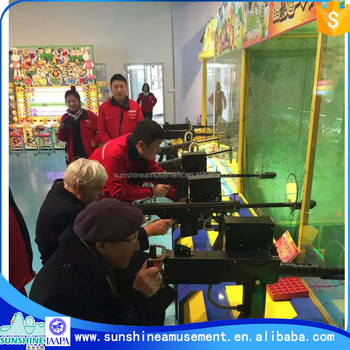 Amusement shooting gun game machine, National patent products. Coin Management, Audit function,it will bring big profit for you. Style: S style :Filling balls automati cally supply.full-automation. F style :Can put 300 pcs of bullets one time.16 bullets per game.It means to need puts bullets after run out.semi-automatic . 1 Style : S Filling balls automati cally supply.full automation. F Can put 300 pcs of bullets one time.16 bullets per game. It means to need puts bullets after run out.semi-automatic . 4 Material: Military seamless steel pipe,Laser Cutting,A sheet metal forming. 5 Technology: National patent Automatically to , supply the bullets circulating. 6 Function: Coin-operated management provide professional security tokens for free. Audit function checked the daily income. Language System English or your own country's language. 8 Logo,theme,targets: can be customized We have a professional design team. 9 Fixed or Mobile : all we can install the pulley under the machine, easy to move. 10 Packing: Wooden case (Standard export wooden). 4.A set with 2 guns ,All body sheet metal processing. 5.The grip is annatto rosewood in Taiwan, the quality is very good. 7.The game rules, medal design, also could customize them for you. 1.It is automatically to , supply the bullets circulating.the top creation all over the world, with national patent.Provincial labor. This feature increases the frequency of the customer to play.Throughput is very large.Can accommodate a large number of customers. 3.Automatic counting bullets,Laser sensors detect the number of bullets fired. 4.Computer statistics, the number of targets hit.Metal proximity switch,To ensure that no damage,The number of bullets fired and Down target,Display Synchronization. 5.Pick up the target automatically,When the game ends,When the new start,The target automatically pick up. 1.Coin-operated management, to provide professional security tokens.can also use local coin. 2.Have the audit function, and can be checked the daily income . 3.Console Display Coin quantity and scores and Countdown time and hull Power ,convenient for daily maintenance management. 4.Language System,English or your own country's language.Voice broadcast,With music. 5.LED lights,Guarantee lighting effects,Attract attention.